Ten years ago, when I first moved to Brighton, the options for affordable eateries on the beach weren’t great. There were (and still are) some fantastic fine-dining options but, if you didn’t want to fork out, you were faced with substandard sandwiches or mediocre fish and chips – in short, you were better off with a packet of sausages and a disposable barbecue. 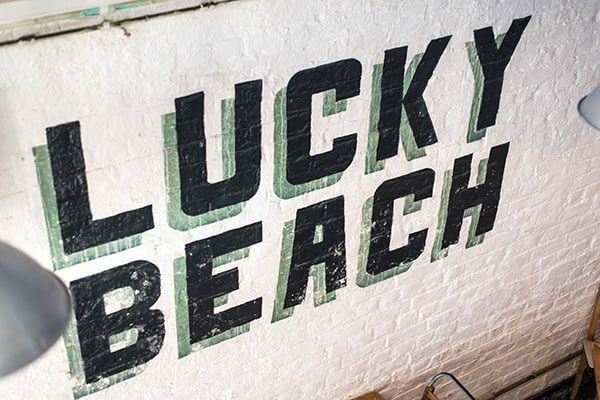 Lucky Beach changed all this when it opened in 2013. It was an instant hit, serving delicious twists on burgers and breakfasts. On a sunny midweek evening, my friend Ella and I strolled along the beach to the café, feeling chuffed that we were making the most of the good weather. It was only 6.30 but Lucky Beach was already busy with diners and drinkers. In the summer the café stays open until 8.30pm, or around sunset, so it’s worth arriving early-ish if you want to bag one of the best seats. We chose a table right on the pebbles, with views of the old pier to the west and the new pier to the east. 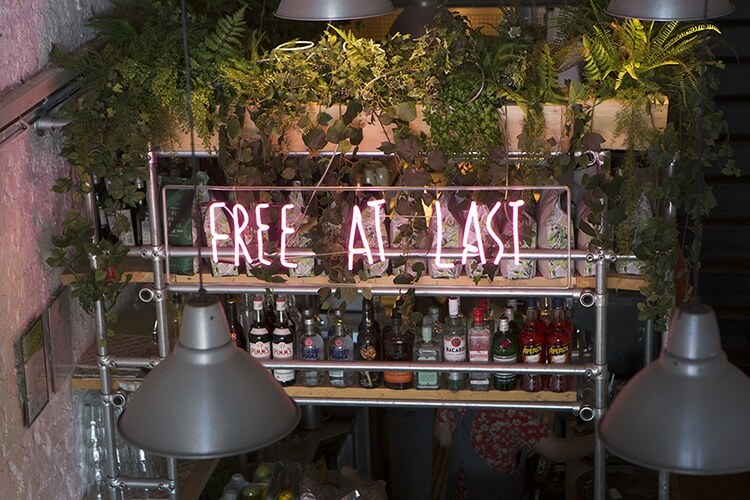 One glance at the drinks menu and it’s not hard to see why this is one of the best places in Brighton for a refreshing drink or coffee. 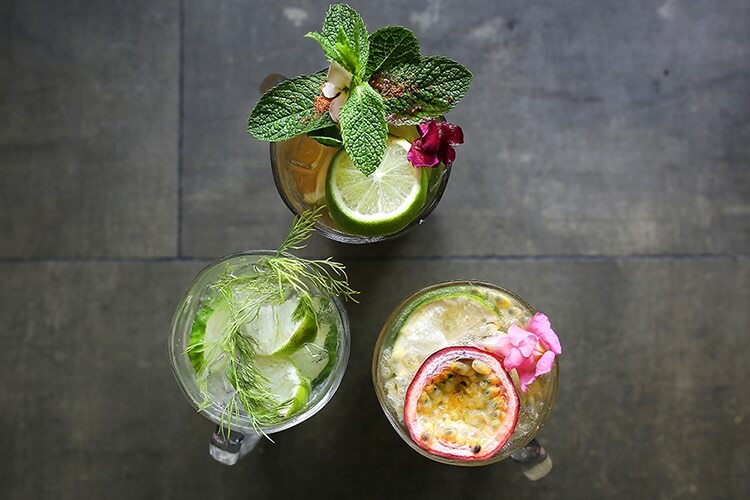 The non-alcoholic options range from passion-fruit fizz, to pomegranate and mint lemonade; and the coffee beans are roasted in the café’s own organic roastery. 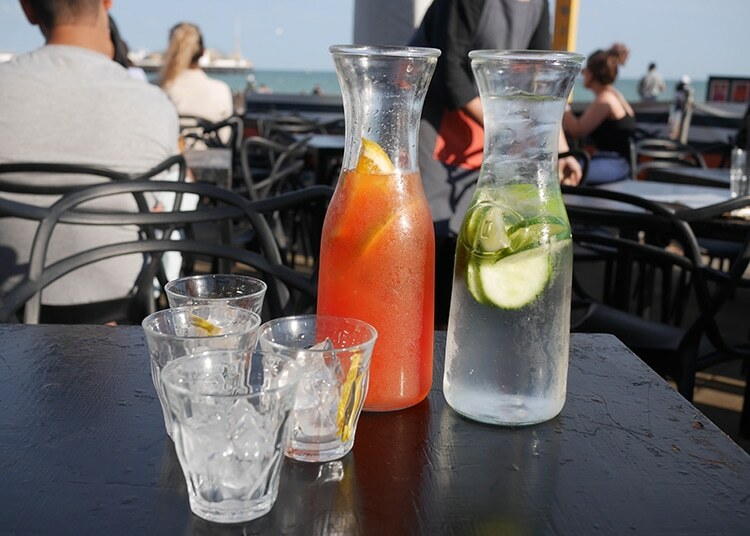 We fancied something alcoholic so, after scrolling through the wines, ciders, spritzes, Brighton gin mixes, and local ales (including their own ‘Lucky Beach Pale Ale’), our eyes fell on the ‘beach classics,’ and we ordered a carafe of ‘pink sparkling sangria’ to share. Made with rose wine, blood orange soda and limoncello, it tasted lighter, fruitier, and more ‘tropical’ than your standard sangria. Be warned: it slips down very easily! 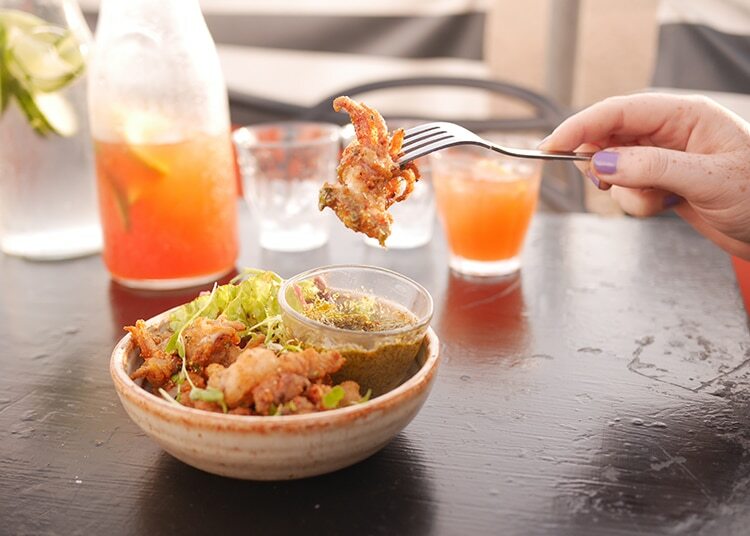 Along with our sangria, we shared a plate of ‘Crispy Masala Squid’, which you can order as a starter (as we did), as a snack, or as a side dish. Incredibly soft and tender, this squid was genuinely some of the best I’ve tasted. Coated in a crispy masala crumb, it was served with a great little salad (edamame peas, grains, leaves and pink pickled cabbage), and a fresh herb dipping sauce that tasted of mint, coriander and lemon. After ‘mmm-ing’ and ‘ahh-ing’ our way through the dish, we almost ordered another plate but, seeing as it was swimwear season, decided better of it. 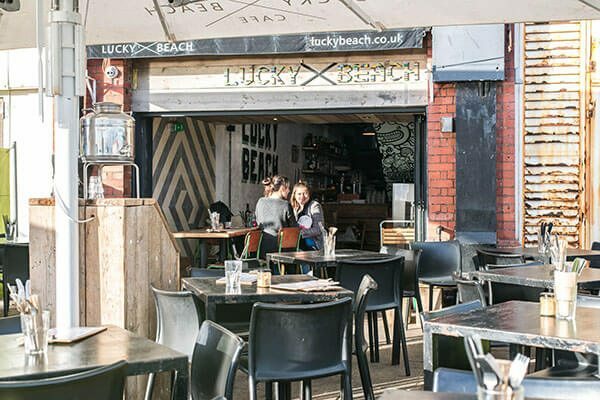 Lucky Beach has been renowned for its burgers since it opened. Specialising in organic meats from native British breeds, the café’s main supplier is a West Sussex farm just outside Brighton. 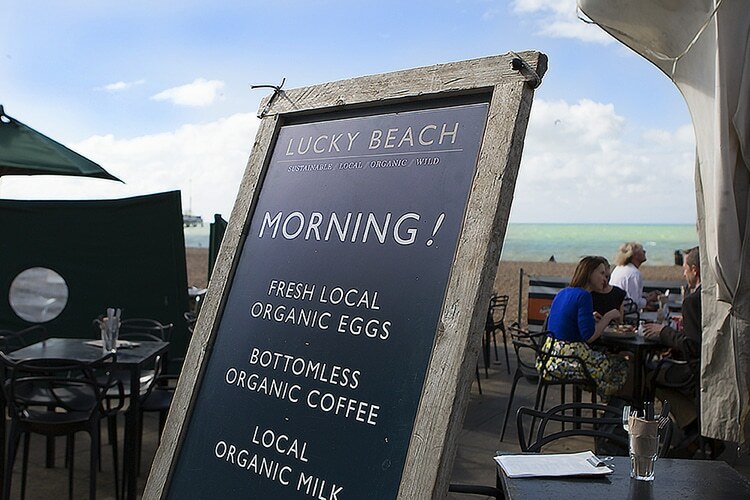 This ethical ethos applies throughout the café: everything from the milk to the fish is local, organic, ethical, sustainable, or all of the above. And I’m not just talking about the food: much of the café’s furniture is reclaimed, and the bar is made using unwanted wood from Shoreham docks. Neither of us had tried the Lucky Beach burgers before, so we decided to take the plunge. With seven different types to try, these are no ordinary hamburgers: dry-aged with Himalayan salt, the ‘Triple-Dan Chan’ includes bulgoggi (marinated meat), sambal (Indonesian hot sauce) and kimchi (korean fermented cabbage); and the ‘Shorthorn’ comes with fig jam, pig candy, hazelnuts and ketchup leather. 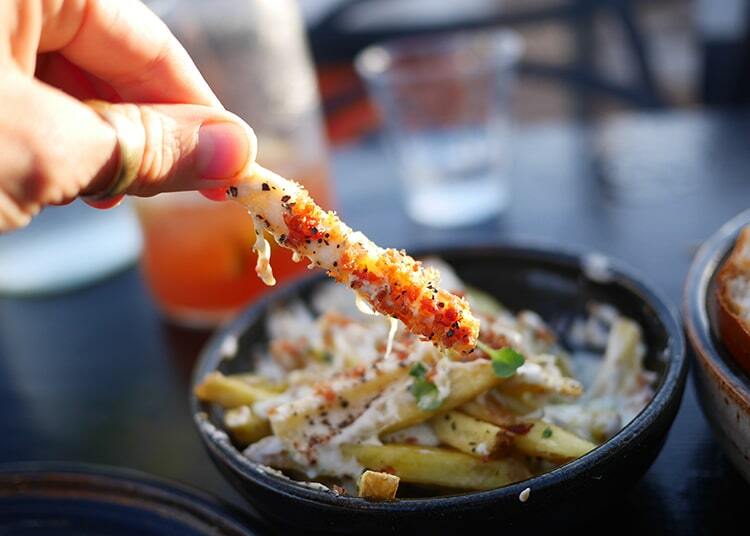 If you don’t fancy a burger, there’s local fish and chips; halloumi and falafel salad, ‘hot fish tacos,’ ‘crab bruschetta,’ and more. 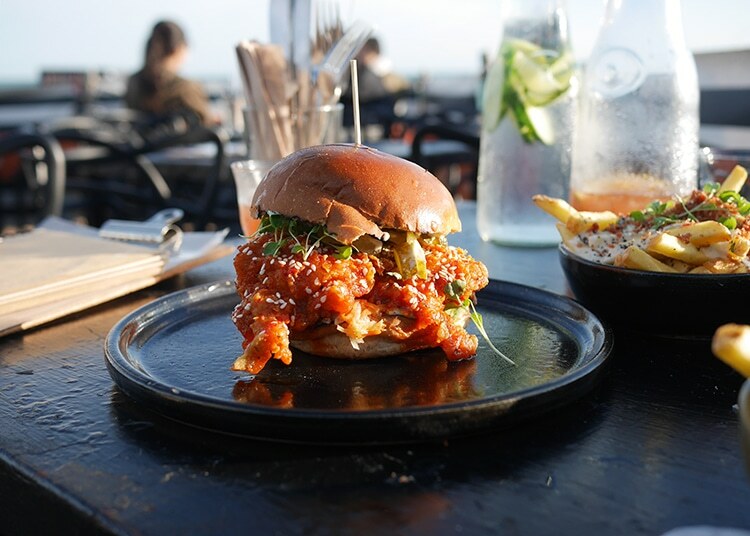 In the end, Ella went for the ‘David Van Day’ and I chose the ‘K-Pop’ chicken burger – a recent addition to the menu. Served slightly pink, Ella’s beef burger was juicy and flavoursome. “Mmmm, what’s that sweet taste?” I asked when I tried a bite. “I think that’s the bourbon glaze,” she grinned. 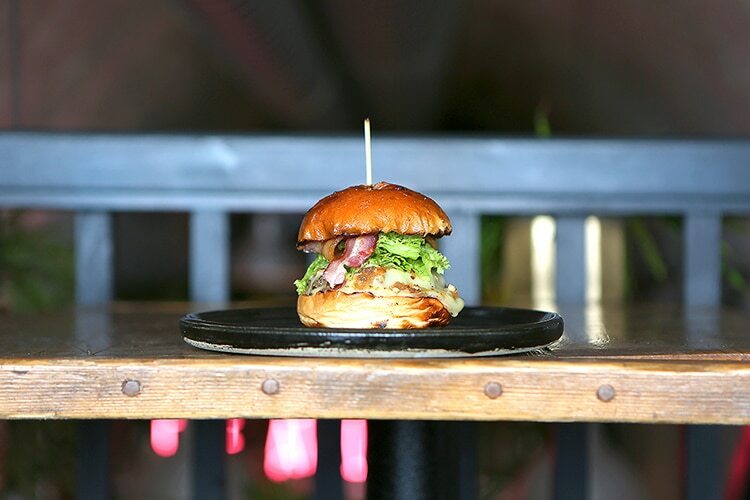 Sandwiched in a brioche-style bun, her David Van Day was topped with crispy bacon and Brighton blue cheese. The K-Pop chicken burger was equally exciting: my Korean-fried chicken breast had a crunchy batter that was studded with sesame seeds. It was flavoured with ‘nam-po’ dressing and ‘gochuchang slaw’ – a spicy Korean salad with shredded cabbage and onion. 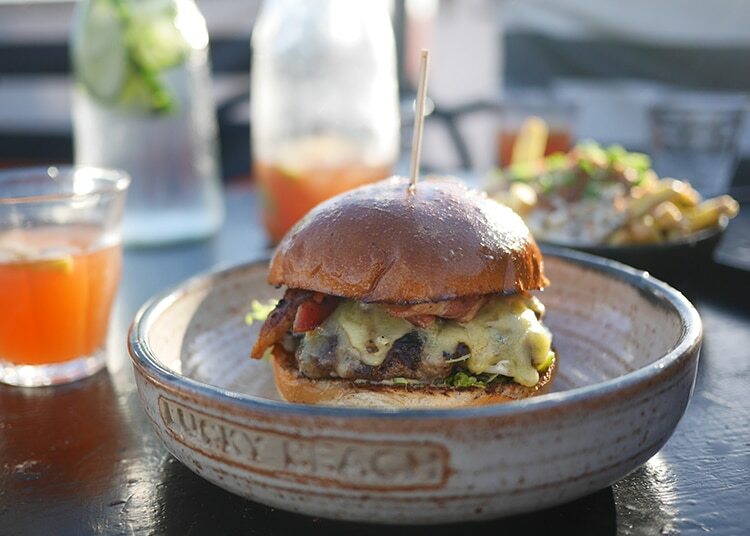 Achieving a fantastic Asian-style balance of sweet, savoury, spicy and salty flavours, you can tell that the talented chefs at Lucky Beach do far more than burger flipping here. 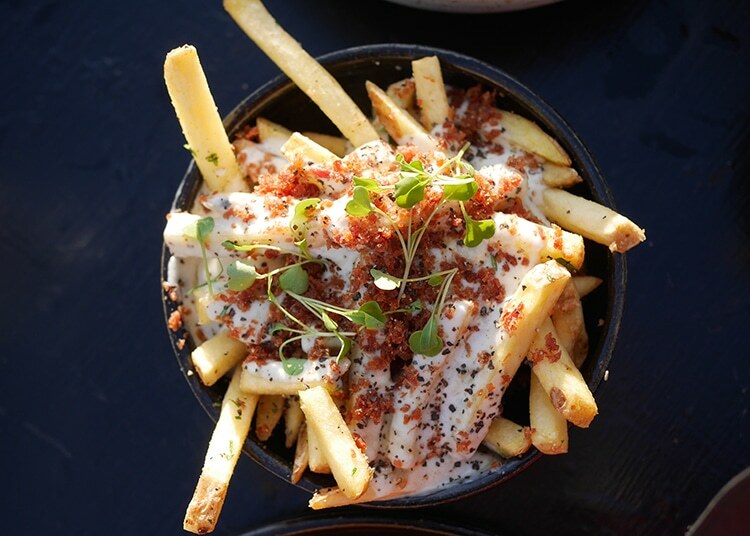 On the side, we ordered skin-on fries – which were crisp, golden, and tossed in herbs and black pepper – plus a portion of ‘blue cheese and bacon fries.’ Smothered in creamy cheese and scattered generously with bacon crumbs, this decadent side went particularly well with the Dan Van Day. 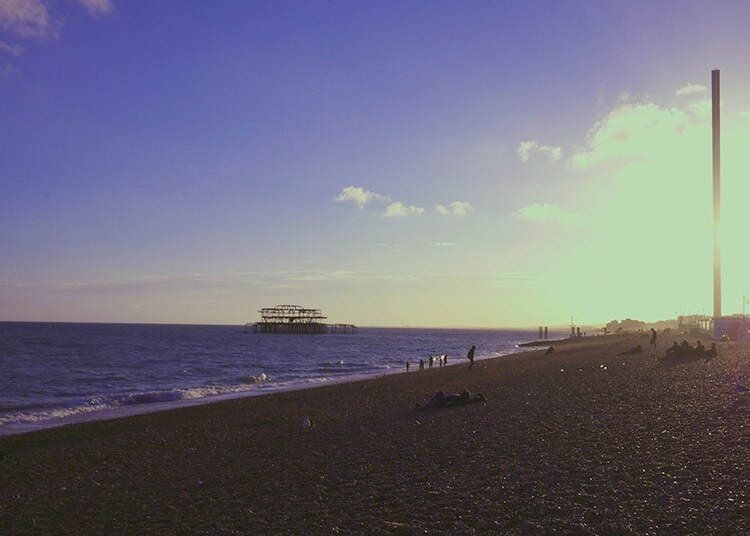 We stayed on the beach until sunset, finishing our sangria as the sun started to sink behind the West Pier. 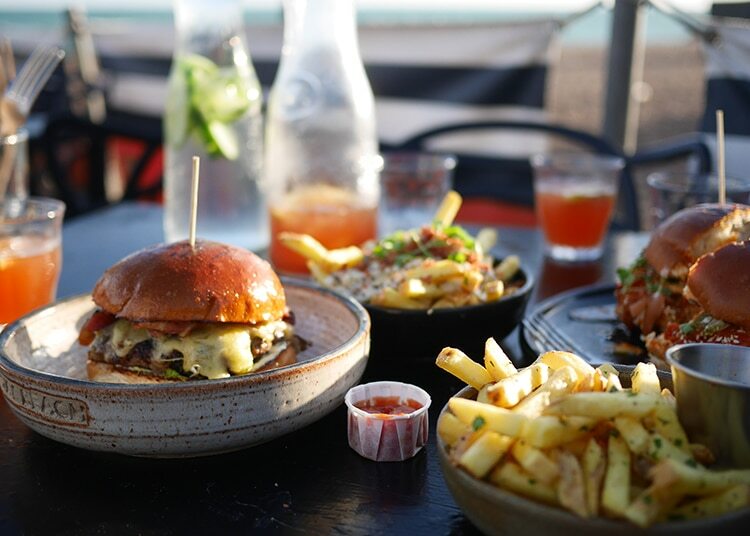 Listening to the roll of the tide on the pebbles, and the screeching of gulls overhead, it felt like the perfect Brighton evening, and we made a pact to start coming here more often – besides, we’ve got five more burger options to work our way through, not to mention the rest of the menu. And, without a doubt, I’ll be ordering that squid every time.